WATCH THE SUNSET, RELAX ON THE TERRACE OR ENJOY BOATING ON ALL SPORTS PINE LK. INCOMPARABLE INTERLAKEN IS AN EXCLUSIVE LAKEFRONT COMMUNITY WITH ITS OWN PARK.RARELY OFFERED, THIS IS THE HOME YOU HAVE BEEN WAITING FOR. WITH OVER 85′ OF LAKE FRONTAGE THIS TIMELESS BEAUTY BOASTS THE FIRST FLOOR MASTER SUITE YOU RICHLY DESERVE.FROM THE LAKESIDE VIEW TO THE PRIVATE SITTING ROOM/OFFICE, HIS & HER MARBLE/GRANITE BATHS & CLOSET ROOMS, YOU WILL BE AWED. THE MOMENT YOU ENTER, THE WATER SPEAKS TO YOU FROM AN EXPANSIVE GREAT RM WITH CUSTOM FIELDSTONE FIREPLACE, DINING LARGE ENOUGH FOR ANY EVENT AND A BRIGHT SUNNY WHITE ISLAND KITCHEN FEATURING DOUBLE SUB ZERO’S,PREMIUM APPLIANCES & EXOTIC STONE. OPEN TO A SUN DRENCHED ADJOINING FAMILY ROOM FOR TODAY’S CASUAL LIFESTYLE. THE SEAMLESS BLEND OF CHARACTER & NEW AMENITIES SHOWS THROUGH FROM THE UPSTAIRS MASTER SUITE WITH SITTING ROOM AND SECOND BEDROOM WITH SITTING ROOM & TWO MORE GREAT BEDROOMS WITH THE FOURTH SERVING AS AN UPSTAIRS OFFICE ALSO. WHOLE HOUSE GENERATOR, EXTRAORDINARY GROUNDS, MOTOR COURT & BLOOMFIELD HILLS SCHOOLS. STYLE, COMFORT AND QUALITY CO-MINGLE TO MAKE THIS HOME THE LUXURY LIVING EXPERIENCE OF A LIFETIME. RENOVATED TO ALMOST NEW BY JOHN MORGAN DESIGN WITH EXTRAORDINARY EXECUTION. EXQUISITE HARDWOOD FLOORS, GLEAMING ARTISAN MILLWORK, SOLID CORE DOORS AND EUROPEAN FIXTURES. WITH ALMOST 4,700 SQ. FT. ON ONE FLOOR, THIS HOME OFFERS AN EASY LIVING LIFESTYLE WITH THE EMPHASIS ON FUNCTIONALITY AND ELEGANCE. DINING FOR 20+, SOLITUDE BY THE FIRE IN THE LIVING ROOM, PRIVACY IN THE COZY DEN OR GET AWAY TO THE MASTER WING STUDY. THE TRUE HEART OF THE HOME IS AN ENORMOUS SUN DRENCHED WHITE SHAKER KITCHEN SPORTING EXOTIC MARBLE, EXPANSIVE ISLAND, STAINLESS APPLIANCES AND SEPARATE STAINLESS PREP KITCHEN AND BUTLERS PANTRY. TODAY’S LIVING MERGES THIS ALL INTO ONE WITH THE FAMILY RM AND ELECTRICALLY SCREENED PORCH. PRIVATE MASTER RETREAT HOSTS A MARBLE BATH WITH EURO SHOWER, HEATED FLOORS AND WALK-IN CLOSET ROOM. WINDING STAIRCASE TO TWO SPACIOUS BEDROOMS WITH THEIR OWN RETRO BATH. HUGE FULL BASEMENT HAS GREAT POTENTIAL. SPECTACULAR PERENNIAL GARDENS ON JUST OVER AN ACRE. If you didn’t buy a home in 2013, you may be kicking yourself now. Home prices climbed nationally an average of 13.6 percent in the past 12 months, according to Tuesday’s release of the Standard & Poor’s/Case-Shiller 20-city home price index. Don’t make the same mistake in 2014, suggests Benjamin Weinstock, real estate attorney and partner at the firm Ruskin Moscou Faltischek in Uniondale, N.Y.
Market forecasters predict that 2014 will be another year of gains for the real estate market, even though the rapid pace of sales in 2013 cooled off a bit at the end of the year. On Dec. 30, The National Association of Realtors said its pending home sales index, based on contracts signed last month, rose 0.2 percent in November, below the 1 percent rise forecast. Home prices are expected to rise about 5 percent next year, says Weinstock. Higher mortgage rates will dampen the pace of both sales and price gains, but not bring them to a halt. The average rate on a 30-year fixed mortgage is expected to rise from 4.5 percent to 5 percent in the next year. Even aside from expected price gains, buying a home is almost always a good investment in the long run, says Weinstock. Tax benefits are not to be overlooked. The spring selling season has historically been the hottest time for home sales in the U.S. That trend remains intact for 2014. Web traffic to real estate websites was up 25% from December to 364 million visits. Zillow (NASDAQ: Z) led the way with over 57 million visits and Trulia (NYSE: TRLA) limped into second at over 30 million visits. It seems nothing can stop Americans from wanting to buy their own homes. It’s almost as if the credit crisis didn’t happen, even though not too long ago we were bombarded daily with stories about crashing prices, underwater mortgages and home foreclosures. It was an American nightmare, not the American Dream. What I usually do at this point in the conversation is a back-of-the-envelope analysis of what it would look like for my client to buy a home. The key components of the analysis involve money saved and money earned. Home sales are at the lowest level in two years. 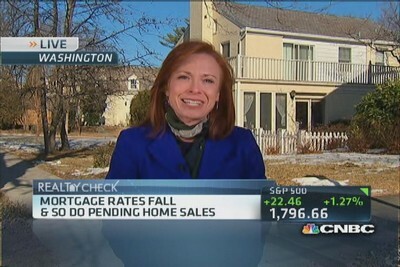 CNBC’s Diana Olick explains what role the “unusually disruptive weather” played in the slumping numbers. How much is saved for the down payment, closing costs and cash reserves? The best scenario involves putting 20 percent down. With 20 percent down, the borrower can receive gifts of up to 100 percent of the down payment with no private mortgage insurance (PMI). PMI can add several hundred dollars to the monthly payment. However, many first-time homebuyers are cash-constrained. Some may qualify for a Federal Housing Administration (FHA) loan, which requires only 3.5 percent down. Many end up putting 10 percent down, which requires PMI and only 5 percent of the down payment can be a gift. Closing costs are approximately 2 percent of the purchase price and include title insurance, escrow fees and appraisal fees. There may be a local transfer tax due on the purchase—and that can be substantial. Lenders require two to 12 months’ worth of cash reserves, which will cover mortgage, property tax, insurance and other debt payments. The cash reserves can be in retirement accounts, but lenders only count 65 percent of retirement accounts, unless you’re over age 59½. Mary would need $65,721 saved to buy this home. Plus, she might need to pay various moving costs. I usually add $5,000 to the analysis so that these costs are accounted for. 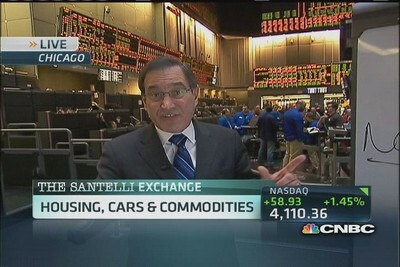 CNBC’s Rick Santelli weighs in on the December pending home sales data and discusses the “choice” natural gas vehicles offer. Does the client earn enough money to qualify to buy the home? Rule of thumb: Lenders require that housing costs (PITI) plus all other monthly debt payments be no more than 43 percent of gross income. In Mary’s case, she would need to earn $86,630 a year to qualify for the $360,000 loan at 5 percent. If this analysis looks positive, I will recommend that my client visit a lender and get prequalified for a loan. This will involve running a credit report. With a credit score of 700 or above, there should be no issues. Below that, a good mortgage professional will advise clients on how to improve their scores. Lastly, a good real estate agent and a good dose of patience will make the experience a lot easier. That dream home may be right around the corner, after all. —By Cathy Curtis, Special to CNBC.com. Cathy Curtis is an independent certified financial planner and founder and owner of fee-only investment advisory firm Curtis Financial Planning, based in Oakland, Calif. If you’re thinking of selling your home in 2014 or just want to ramp up your home value, it’s important to educate yourself on which improvement projects will bring you the most return on your investment. You may not even notice your front door anymore, especially if you regularly use another entrance, but a new door makes a great impression on buyers and yields an 86 percent return on your investment. If your front door doesn’t need replacing or you’d rather spend less money, you can paint it and replace the hardware for a similar impact. Replacing your garage door recoups 75 percent of your investment. No matter where you live, buyers are looking for outdoor living space. You can recoup 77 percent of your investment on a new wood deck. If you already have outdoor space, consider enhancing it with a water feature, an outdoor fireplace or new landscaping. Depending on your budget and your goals for your home, an addition of extra bedrooms and bathrooms, a finished attic or an expanded casual living space can rapidly increase the value of your home. You can recoup 73 percent of your investment in an attic bedroom. Buyers look most carefully at kitchens and bathrooms, so you should, too. You can recoup 75 percent of a minor kitchen remodel and 60-68 percent of a major kitchen remodel. If you’re selling soon, be careful not to overspend on your kitchen. You may be able to do one or two things, such as replacing the appliances and painting the cabinets, or just replacing the counters with granite to garner a good offer. Buyers are interested in how your windows look and their energy efficiency. Whether you’re replacing vinyl- or wood-frame windows, you can get a 72 percent return on your investment. When you’re ready to market your home, be sure to highlight the new windows as a selling point. Today’s buyers like bright, light rooms, so look around your home and see if you need to upgrade your lighting fixtures or add more. You can hire a professional to add a few recessed lights to your kitchen and living areas and replace outdated overhead lighting fixtures to match contemporary tastes. Make sure you’re letting as much natural light as possible into your home and that your window treatments don’t hide any oversized windows. While a full, upscale bathroom remodeling project can cost as much as $50,000 and add only about $29,000 to your home’s resale value, you can make cost-effective minor upgrades. Replace your fixtures and your mirror, repaint the space and jazz it up with some crown molding (depending on your home’s style) and you’ll have a space that looks new. While you’re there, redo the caulk around your tub and shower and replace the grout on your tile flooring. If your tub is in bad shape, you may be able to have it resurfaced rather than replace it. If your home’s exterior needs a major makeover, you can typically recoup 72 percent of your investment by replacing the siding. No matter which project you choose, be careful not to over-improve your home for the neighborhood. A REALTOR® can offer advice about how to spend your money so that your home sells faster and for the best possible price. Existing-home sales in May were up 12.9% from the same period in the prior year — the largest growth since October 2011. Meanwhile, year-over-year median prices rose 15.4% in May, the largest growth since 2005. Existing-home sales rose 4.2% in May to a seasonally adjusted annual rate of 5.18 million. These sales were 12.9% higher than during the same period in the prior year. Economists polled by MarketWatch had expected the pace of existing-home sales to hit a rate of 5 million in May, compared with an April rate of 4.97 million. “This report provides further evidence that the housing market is on a firmly improving trend,” wrote analysts at RDQ Economics in a research note. Meanwhile, the median existing-home price hit $208,000 in May, the highest since 2008, with low inventory supporting prices. The median price is up 15.4% from the same period in the prior year, the largest growth since 2005. Inventories rose 3.3% in May to 2.22 million existing homes for sale. The supply of existing homes declined to 5.1 months at May’s sales pace from 5.2 months at April’s sales pace. The share of the sales accounted for by distressed properties and first-time buyers remained low in May. Analysts say the housing market’s gains over the past year could have been even larger if inventories were greater. Still, economists expect housing demand to continue to grow along with the U.S. economy. As home prices continue to rise, more buyers are likely to be able and willing to put their homes on the market. Rising prices also induce buyers to bid before prices get too high. However, NAR said prices are rising too quickly and more construction is needed. Existing-home sales rose 4.25 in May and home prices climbed more than 15% year over year. Low interest rates have been fueling demand. In recent weeks these rates have trended higher, though there was a recent decline. While rising rates will curb demand among some buyers, they could also spur others to quickly enter the market to take advantage of high affordability. “Given the massive rise in mortgage rates in recent weeks, we expect the pace of positive momentum will likely slow in the coming months, though the initial reaction could be for some buyers to move into the market as they try to lock-in the lower mortgage rates,” wrote Millan Mulraine, director of U.S. research and strategy at TD Securities. Despite their recent climb, rates remain relatively low, as Federal Reserve Chairman Ben Bernanke pointed out Wednesday. “In terms of monthly payments on an average house, the change in mortgage rates we’ve seen so far is not all that dramatic,” Bernanke said at a press conference following the central bank’s decision to leave policy unchanged. Indeed, Americans’ views on the housing market recently hit a multiyear high, with large shares saying that now is a good time to buy and sell homes. However, recent price gains don’t necessarily signal that real estate is a good long-term investment, according to Yale economist and housing expert Robert Shiller. Ruth Mantell is a MarketWatch reporter based in Washington. Follow her on Twitter @RuthMantell.